They hold weekly “challenges” of sorts, where Nichole Heady (co-owner of PTI and crafter extraordinaire) showcases on her blog a tutorial of a technique that might be useful to stampers. The readers are invited to play along, and this is the first time that I’ve done so (partially because this is the first week in which I’ve had a blog to link up). I am so excited for this project… it’s one of the first things that I’ve made just for *me* in a while. 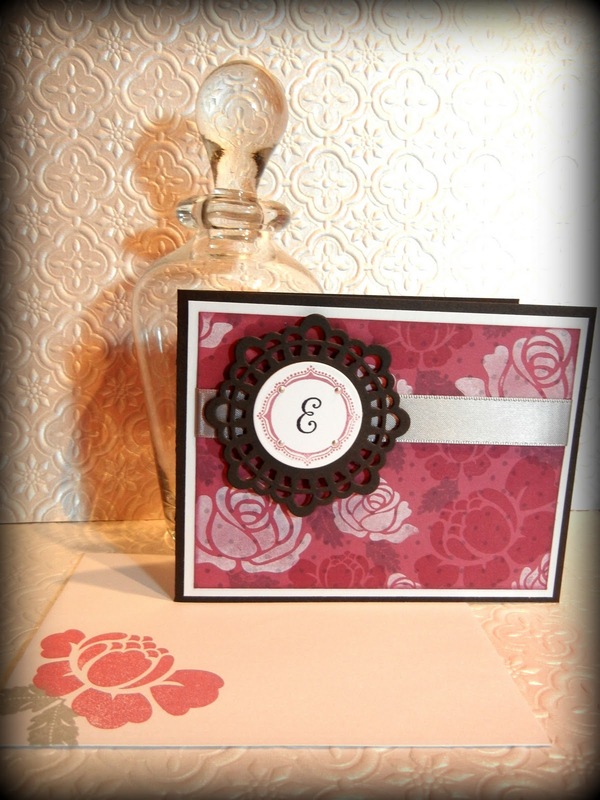 I utilized one of my newest stamp sets: Rosie Posie. It was released in December, and it is indescribable how excited I was to receive it. I will admit that I was quite intimidated by this stamp set for the first 5 days that I had it. So many possibilities… My poor little brain was swirling with tidbits of ideas that never seemed to make one single, useable project. Finally, I just got out my stamps and started playing. “Multi-Stamp Background Building” for my project. The point is, basically, to put to use those stamps that would be focal points and build a completely unique background. I’ve done this a few times since watching Nichole’s video, and I have to say… it’s definitely one of my favorite techniques. I’d love to try it with some of my larger stamps on a piece of 12×12 scrapbook paper, so as to create my own scrapbook paper, but alas… PTI does not sell their Stamper’s Select paper in anything larger than 8.5×11. It saddens me. I made myself a little box to hold my stationery, 8 notecards (4 each of two different designs) and some lovely coordinating envelopes! First, the box: I used a PTI “Timeless Template” named “All Boxed Up.” (I’ve made several of these, and they are just adorable! So easy to put together, too!) You basically print, cut, score, tape, and you’re done! Maybe 30 minutes to make the whole thing. The front is the more complicated part: it uses several different stamps and inks, as well as die-cutting the doily shape and circles. I did exactly as Nichole’s video said to do: start with your largest image first, then the medium sized image, then fill in the blank spaces with your smallest image. In addition to my Rosie Posie stamp set, I used PTI Autumn Rose carstock and ink, Smokey Shadow cardstock and felt, Cat’s Eye pigment inks, Memento London Fog ink, and ribbon from my stash. The monogram was created with Martha Stewart’s custom stamp set that I bought at Joann’s, and the decorative border for the monogram was from PTI Boxes, Bags, and Tags. The cards are made in basically the same vein, with a few subtle twists. On this set, I used Rosie Posie to build the background again, but this time I went over it with PTI Background Basics: Polka Dots in the London Fog just to fill it out nicely. I cut the little Smokey Shadow doily from the Doily Details die from PTI, popped it up with some pop dots, and used a Smokey Shadow card base. I really like how this one turned out… kinda reminds me of Anna Griffin. 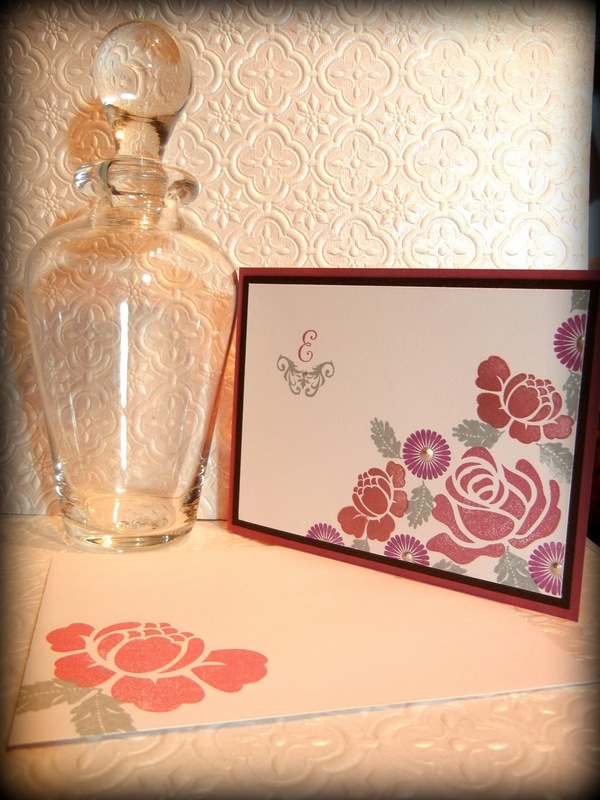 The other notecard set was built using the same formula; I didn’t, however, cover the entire front panel with the floral image. I decided to make a flat card, keeping the monogram on the front panel with the rest of the stamping. I covered a little less than half of the decorative panel with stamping, and I really like how this one turned out, as well. 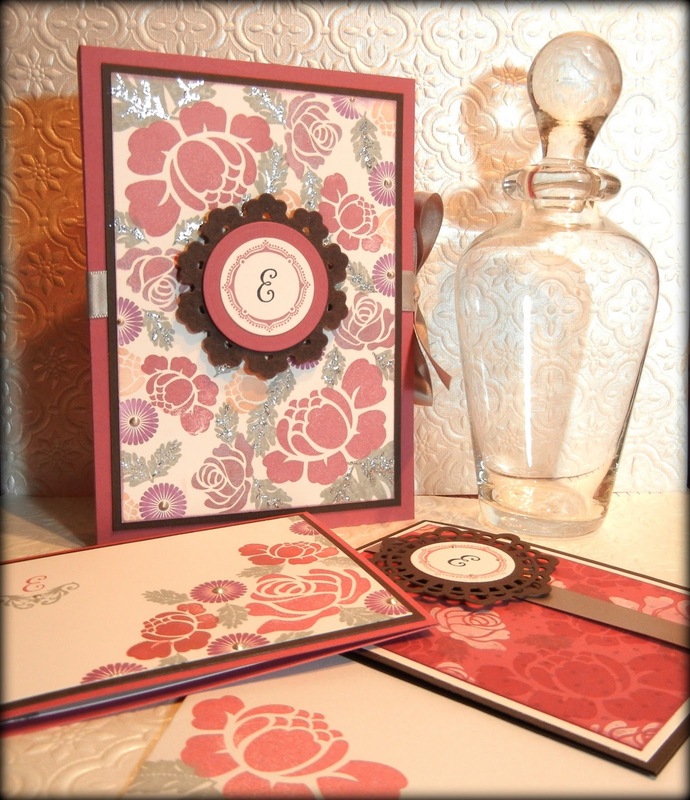 The flourish beneath the monogram is from Mat Stack 2 by PTI, and the card base is Autumn Rose. Whew, I did not mean for this to become such an incredibly long post. I told you, I talk… a lot. I am so excited to play along with this week’s MIM challenge… I hope this is the first of many to come! It's good to share with other like minded people. The Rosie posie background is beautiful. I love PTI too! Thank you for the comments, ladies! I hope nobody would throw it away, but one of my closest friends (who obviously isn't as sentimental as I am) said to me of the painstakingly-created graduation card I mailed to her: "You should feel special… I haven't thrown your card away yet." The thought terrifies me.